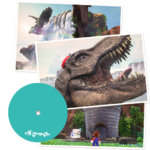 Among the lists of Power Moons, capturable enemies and Crazy Cap souvenirs, Super Mario Odyssey also features a "Music List" where players can listen to the game's soundtrack. 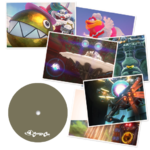 A song can even be selected to play over the regular background music, except on the world map and certain areas like the New Donk City Hall Auditorium. 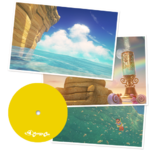 The list itself is unlocked only after beating the game, although most of the songs don't become available until the player has heard them at least once in the game. Additionally, in certain kingdoms, Jammin' Toad requests a specific song from Mario to play on his headphones, and fulfilling them unlocks two more songs in the list. The majority of the game's soundtrack was composed by Naoto Kubo, with additional music by Shiho Fujii and Koji Kondo. There are a total of 82 songs in the Music List. 01 - Bonneton - Plays throughout the Cap Kingdom. 02 - Fossil Falls - Plays throughout the Cascade Kingdom, and in the first section of the Darker Side. 03 - Fossil Falls (8-Bit) - A NES chiptune-style arrangement of "Fossil Falls" that plays in the 8-bit sections in the Cascade Kingdom. 04 - Fossil Falls: Dinosaur - Plays while capturing a T-Rex, or being chased by one. 05 - Tostarena: Ruins - Plays in Tostarena Ruins in the Sand Kingdom, and in the second section of the Darker Side. 06 - Tostarena: Ruins (8-Bit) - A NES chiptune-style arrangement of "Tostarena: Ruins" that plays in the 8-bit sections in Tostarena Ruins. 07 - Tostarena: Night - Plays in the Sand Kingdom at night during the "Hole in the Desert" objective. 08 - Tostarena: Night (8-Bit) - A NES chiptune-style arrangement of "Tostarena: Night" that plays in the 8-bit sections in the Sand Kingdom at night. 09 - Tostarena: Town - Plays in Tostarena Town after defeating Knucklotec. 10 - Tostarena: Jaxi - Plays while riding a Jaxi. 11 - Steam Gardens - Plays in Iron Road in the Wooded Kingdom, and in the third section of the Darker Side. 12 - Steam Gardens (8-Bit) - A NES chiptune-style arrangement of "Steam Gardens" that plays in the 8-bit section in the Wooded Kingdom. 13 - Steam Gardens: Sherm - A variation of "Steam Gardens" that plays while fighting the cannon during the "Path to the Secret Flower Field" objective, or while fighting a Yoofoe, in the Wooded Kingdom. 14 - Lake Lamode 1 - Plays while underwater in the Lake Kingdom. 15 - Lake Lamode 1 (8-Bit) - A NES chiptune-style arrangement of "Lake Lamode 1" that plays in the 8-bit section in the Lake Kingdom. 16 - Lake Lamode 2 - A variation of "Lake Lamode 1" that plays while on land in the Lake Kingdom. 17 - Lake Lamode: Underwater Passage - Plays in the underwater path leading to the main lake in the Lake Kingdom, as well as in the Underwater Tunnel to the Lighthouse in the Seaside Kingdom. 18 - Forgotten Isle 1 - Plays when Cappy is captured by Klepto in the Lost Kingdom. 19 - Forgotten Isle 2 - Plays throughout the Lost Kingdom, and in the fourth section of the Darker Side. 20 - Forgotten Isle 2 (8-Bit) - A NES chiptune-style arrangement of "Forgotten Isle 2" that plays in the 8-bit section in the Lost Kingdom. 21 - New Donk City: Night 1 - Plays in the Metro Kingdom at night during the first half of the "New Donk City's Pest Problem" objective. 22 - New Donk City: Night 2 - Plays in the Metro Kingdom at night after capturing a Sherm during the "New Donk City's Pest Problem" objective, and in the secret areas containing the "Under Siege" moons in the Metro Kingdom and Dark Side. 23 - New Donk City: Daytime - Plays throughout the Metro Kingdom during the day. 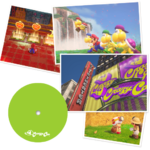 24 - New Donk City: Cafe - A piano arrangement of the Super Mario World overworld theme that plays on the boom box near the rooftop pool. 25 - New Donk City (Band Performance) - The song the band plays in the New Donk City Hall Auditorium. It is a big-band arrangement of the Ground Theme from Super Mario Bros.
26 - NDC Festival - A variation of "Jump Up, Super Star!" that plays during the New Donk City Festival and on the main surface of the Darker Side. 27 - NDC Festival (Japanese) - "NDC Festival" with Japanese vocals. Certain boom boxes play this version when Mario hits them with Cappy. 28 - NDC Festival (8-Bit) - A NES chiptune-style arrangement of "NDC Festival", albeit without vocals. 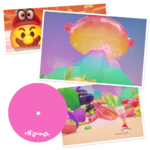 The player can request this version to be played over the New Donk City Festival to the New Donker at the auditorium; doing so would also replace Pauline's artwork on the billboards with her original sprite from Donkey Kong. It is unlocked after fulfilling all five of Jammin' Toad's requests. 29 - Bubblaine - Plays while on land in the Seaside Kingdom. 30 - Bubblaine: Underwater - A variation of "Bubblaine" that plays while underwater in the Seaside Kingdom. 31 - Bubblaine (8-Bit) - A NES chiptune-style arrangement of "Bubblaine" that plays in the 8-bit sections in the Seaside Kingdom. 32 - Shiveria: Town - Plays in Shiveria Town in the Snow Kingdom. 33 - Shiveria: Race-Course Entrance - Plays in the entrances to the Bound Bowl Grand Prix. 34 - Mount Volbono - Plays outside of Peronza Plaza in the Luncheon Kingdom, and in the fifth section of the Darker Side. 35 - Mount Volbono (8-Bit) - A NES chiptune-style arrangement of "Mount Volbono" that plays in the 8-bit sections in the Luncheon Kingdom. 36: Mount Volbono: Town - Plays in Peronza Plaza in the Luncheon Kingdom. 37 - Bowser's Castle 1 - Plays in the courtyards leading up to the Main Courtyard of Bowser's Kingdom, and in the sixth section of the Darker Side. 38 - Bowser's Castle 1 (8-Bit) - A NES chiptune-style arrangement of "Bowser's Castle 1" that plays in the 8-bit section in Bowser's Kingdom. 39 - Bowser's Castle 2 - Plays in Bowser's Castle. 40 - Honeylune Ridge - Plays throughout the Moon Kingdom and the Dark Side, and the 8th and final section of the Darker Side. 41 - Honeylune Ridge (8-Bit) - A NES chiptune-style arrangement of "Honeylune Ridge" that plays in the 8-bit section in the Moon Kingdom. 42 - Honeylune Ridge: Caves - Plays in the Underground Moon Caverns in the Moon Kingdom and the seventh section of the Darker Side. 43 - Honeylune Ridge: Wedding Hall - Plays in the Wedding Hall in the Moon Kingdom. 44 - Honeylune Ridge: Collapse - Plays during the first half of the escape sequence. 45 - Honeylune Ridge: Collapse (8-Bit) - A NES chiptune-style arrangement of "Honeylune Ridge: Collapse" that plays in the 8-bit section during the escape sequence. 46 - Honeylune Ridge: Escape - The vocal song "Break Free (Lead the Way)", which plays during the second half of the escape sequence. 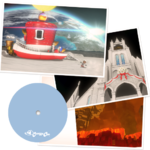 47 - Honeylune Ridge: Escape (Japanese) - "Break Free (Lead the Way)" with Japanese vocals. Certain boom boxes play this version when Mario hits them with Cappy. 48 - Honeylune Ridge: Escape (8-Bit) - A NES chiptune-style arrangement of "Break Free (Lead the Way)", albeit without vocals. It is unlocked after fulfilling at least three of Jammin' Toad's requests. 49 - Peach's Castle - An arrangement of "Inside the Castle Walls" from Super Mario 64 that plays inside Peach's Castle in the Mushroom Kingdom. 50 - Broodals Battle - Plays while fighting Topper, Hariet, Spewart or Rango. 51 - Madame Broode Battle - Plays while fighting Madame Broode in the Cascade Kingdom and Moon Kingdom. 52 - Knucklotec Battle - Plays while fighting Knucklotec in the Sand Kingdom and Mushroom Kingdom. 53 - Torkdrift Battle - Plays while fighting Torkdrift in the Wooded Kingdom and Mushroom Kingdom. 54 - Mechawiggler Battle - Plays while fighting Mechawiggler in the Metro Kingdom and Mushroom Kingdom. 55 - Mollusque-Lanceur Battle - Plays while fighting Mollusque-Lanceur in the Seaside Kingdom and Mushroom Kingdom. 56 - Mollusque-Lanceur Battle (8-Bit) - A NES chiptune-style arrangement of "Mollusque-Lanceur Battle" that plays in the 8-bit sections during the boss fight in the Seaside Kingdom. 57 - Cookatiel Battle - Plays while fighting Cookatiel in the Luncheon Kingdom and Mushroom Kingdom. 58 - Ruined Dragon Battle - Plays while fighting the Ruined Dragon in the Ruined Kingdom and Mushroom Kingdom. 59 - RoboBrood Battle - Plays while fighting RoboBrood in Bowser's Kingdom and the Dark Side. 60 - Bowser Battle 1 - Plays while fighting Bowser in the Cloud Kingdom. 61 - Bowser Battle 2 - Plays during the final battle with Bowser in the Moon Kingdom. 62 - Run, Jump, Throw! 1 - Plays in secret areas. 63 - Run, Jump, Throw! 2 - Plays in secret areas. 64 - Run, Jump, Throw! 2 (8-Bit) - A NES chiptune-style arrangement of "Run, Jump, Throw! 2" that plays in the 8-bit sections of certain secret areas. 65 - Subterranean 1 - Plays in secret areas. It also plays in the Underground Power Plant in the Metro Kingdom. It is an arrangement of "Space Athletic" from Super Mario Galaxy, which in turn is an arrangement of the Super Mario Bros. underground theme. 66 - Subterranean 1 (8-Bit) - A NES chiptune-style arrangement of "Subterranean 1" that plays in the 8-bit sections of certain secret areas. 67 - Subterranean 2 - Plays in the Jaxi Ruins. It is an arrangement of the Super Mario Bros. underground theme taken from Captain Toad: Treasure Tracker. 68 - Caves - Plays in Top-Hat Tower, the poison tide, and the secret frog pond in the Cap Kingdom. 69 - Ice - Plays in the Ice Cave and Underground Temple in the Sand Kingdom, and in the four sub-areas of the Snow Kingdom. 70 - Another World - Plays in otherworldly-themed secret areas. 71 - Ruins - Plays in the Inverted Pyramid, Transparent Maze and Bullet Bill Maze in the Sand Kingdom, as well as bonus areas. 72 - Ruins (8-Bit) - A NES chiptune-style arrangement of "Ruins" that plays in the 8-bit sections of the Inverted Pyramid in the Sand Kingdom. 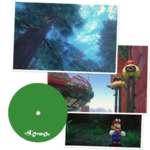 73 - Projection Room: Above Ground - The original Ground Theme from Super Mario Bros. that plays in the World 1-1 replica in New Donk City's projection room. 74 - Projection Room: Underground - The original Super Mario Bros. underground theme that plays in the bonus room in the World 1-1 replica in New Donk City's projection room. 75 - Above the Clouds - Plays in bonus areas. 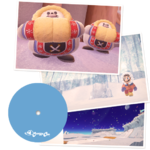 It is an arrangement of the music heard in the Switch Palaces and Bonus Game in Super Mario World. 76 - Toad Brigade Member - The Toad Brigade's theme from Super Mario Galaxy that plays when talking to Captain Toad. 77 - To the Next Kingdom - Plays on the world map. 78 - Shop - Plays in the Crazy Cap stores. 79 - Race - Plays in racing minigames, such as the Bound Bowl Grand Prix and Koopa Freerunning. 80 - RC Car - Plays in the RC Car Challenge minigame in the Metro Kingdom. It is an arrangement of the Mario Circuit theme from Super Mario Kart. 81 - Spinning Slots - Plays in the slots minigame rooms and certain secret areas. It is an arrangement of the Spade Panel minigame music from Super Mario Bros. 3. 82 - Climactic Duel! 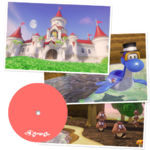 - Plays in the Koopa Trace-Walking and Picture Match minigames. This page was last edited on September 15, 2018, at 20:13.